Joshua H. Eichenstein is an Associate Attorney at ADLI Law Group. Mr. Eichenstein works in the firm’s civil litigation and appellate practice with a primary focus on intellectual property matters. Mr. Eichenstein has represented and litigated against Fortune 500 companies, and litigated many trademark, trade-dress, copyright, and patent matters in California Federal and State courts. Mr. Eichenstein takes a practical and logical approach in his matters by always keeping the client’s goals in mind. 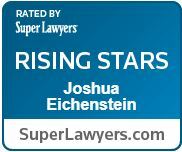 In 2017 and 2018, he was awarded Southern California “Rising Star” by Super Lawyers magazine; awarded only to 2.5% of attorneys in the region. Prior to joining ADLI Law Group, Mr. Eichenstein was an associate at a boutique IP firm in Beverly Hills. In this capacity, he not only litigated a wide variety of matters, but also engaged in a transactional practice by drafting contracts, forming business entities, and filing copyrights and trademarks. Mr. Eichenstein received his legal education at Southwestern Law School in Los Angeles, CA where he received the Dean’s Merit Award for students who have demonstrated academic excellence. As a law student, Mr. Eichenstein clerked one summer with the Los Angeles District Attorney’s Office in the Major Narcotics Division, and a full year in the legal affairs division of CBS Television. Mr. Eichenstein’s broad experience prior to law school includes having worked in the entertainment industry, being a musician, and having played a summer of professional baseball for the Netanya Tigers of the Israel Baseball League. Will Dealing with Cannabis Leave You Bankrupt?